A threes-story victorian house on wheels, powered by steam, to be built for Burning Man. Wow. 19 airport workers and TSA agents who were fighting the War on Moisture were hospitalized today after the hell-brew of confiscated liquids they had been mixing began to offgas something toxic — likely a by-product of mace or pepper-spray. An awesome pirate tree house. “White House aides say the president has read 60 books so far this year.” Ha ha ha ha ha ha ha!!! Yeah, right. Ha ha ha ha ha ha ha!!! 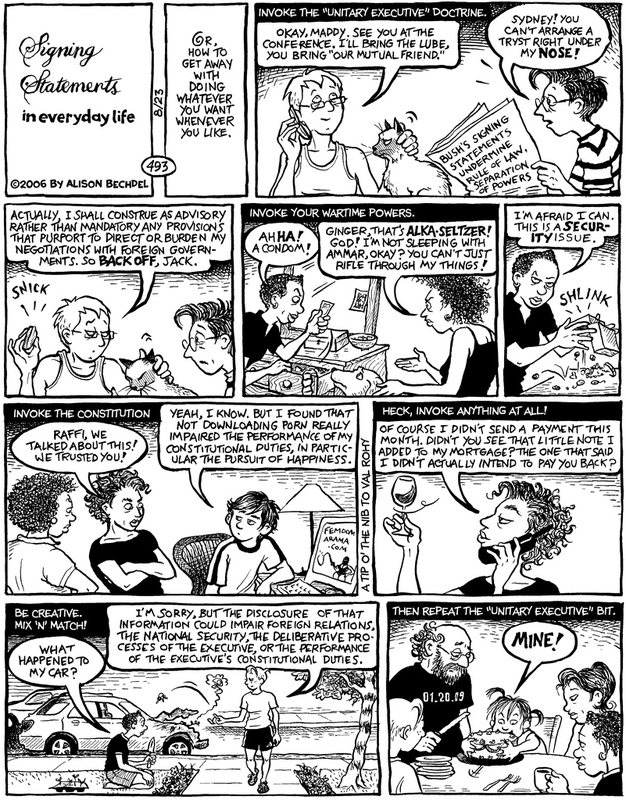 Alison Bechdel applies Bush’s strategy to all aspects of life.